Every year, scores of adventurous men and women compete in one of the most grueling racing events, the SCORE Baja 1000. This year's 1,130-mile race -- the 47th Tecate SCORE Baja 1000 -- will take place November 12 through 16. It will start in Ensenada, Baja California, and end 1,130 miles and 30 to 40 hours later in La Paz, Baja California Sur. Also every year, children from all around the world -- some from the most remote and impoverished regions on the planet -- make equally grueling journeys to the United States to receive life saving surgery to correct congenital heart defects. HeartGift, a laudable organization that makes such journeys and treatment possible, expects to sponsor 40 such children this year. Those "journeys" not only involve thousands upon thousands of miles of travel, including by foot and on horseback , but also heartrending experiences that take tremendous emotional, physical and financial tolls on already anguished and impoverished parents. You see, so many of these parents know that unless their child receives the intricate surgery needed to correct his or her life-threatening heart defect -- specialized treatment that is scarce or nonexistent where they live -- their child may die. They live with this intolerable fear and anguish for months, sometimes for years. The parents of 3-year-old Frances from Nigeria had to mortgage their small farm to pay for the "echo" tests, before HeartGift became involved. Several children have come from remote villages in China, such as 3-year-old Jiating whose father earned about $140 a month, almost half of it going to pay for Jiating's frequent medical treatments. Some of the children brought to the U.S. for treatment by HeartGift hail from nomad families on the steppes of Mongolia, others from the Andes Mountains in Bolivia and Ecuador, still others from tropical Nigeria. Kelly, from Nicaragua, was diagnosed with heart disease when she was only a few days old. 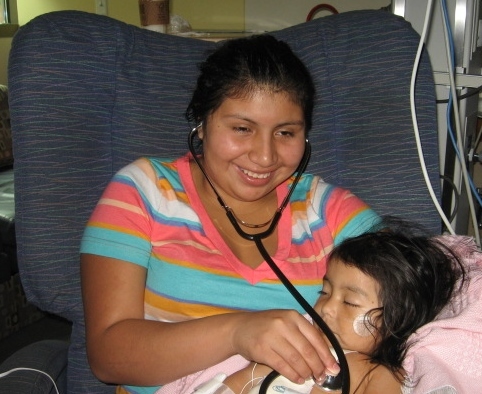 Finally, when she was 13, HeartGift made it possible for Kelly to receive healing surgery. Wahab came from war-ravaged Iraq in 2008. Little Norbu joined the Shechen Monastery in Nepal when he was five, and it wasn't until he was 12 that HeartGift was able to bring him to Dell Children's Hospital in Austin for open-heart surgery. At this point, readers who have gotten this far may well ask, "all good and well, but what does all this have to do with the Baja 1000?" Good question and it brings me to a daring, adventurous, generous and bighearted couple from Houston, Texas, Kay and Greg Crouch. The Crouches, well-known Houstonian benefactors and founding Board members of the Houston Chapter of HeartGift, will be racing their newly made-over, neon pink and purple "Baja Bug" over one of the longest and most dangerous desert circuits in the world -- the aforementioned Baja 1000 -- in November. That covers the "daring and adventurous" part. 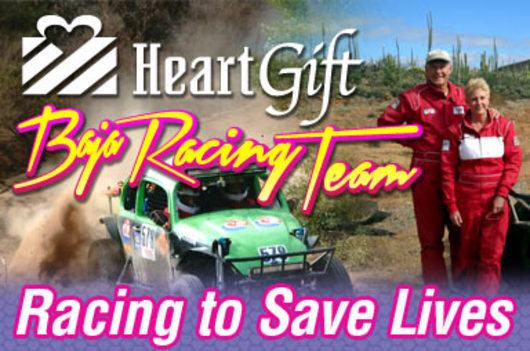 As to the "generous and bighearted" aspect, the Crouches will be driving their "HeartGift Baja Bug," #579, in the Baja 1000 to raise awareness and money for HeartGift, an organization that has already saved the lives of more than 200 little patients from more than 30 countries. Along with their team, appropriately named "the HeartThrobs," and their HeartGift Baja Bug, the Crouches have been touring Houston and other cities in Texas to raise awareness of this wonderful organization and of the life-saving work HeartGift does and to collect pledges for every mile they complete of the Baja desert challenge. Kay and Greg drove in last year's 883-mile Baja race. This year's race is even more challenging, but a challenge the Crouches gladly accept to raise money for HeartGift, for the children who every day of their life face much bigger risks and challenges than the Baja 1000 could ever offer. For, as arduous as the Baja 1000 is, it pales in comparison to the torturous paths children such as Emily from Ecuador, Saranzaya from Mongolia, so many others and their parents have had to travel to get to life-saving medical care. Take the parents of baby Emily, who live high up in the Andes Mountains. For a living, they grow vegetables and beautiful flowers and sell them at a small, distant market. Very early, they knew there was something wrong with their baby and embarked upon a long and stressful series of consultations and tests, involving numerous grueling trips from their home in the mountains by foot and by horse-back, baby in arms, into the nearest town, frequently followed by long, 12-hour bus rides to the capital, Quito, and back. All this only to be eventually told that baby Emily suffered from a life-threatening ventricular septal defect (VSD), also known as a "hole in the heart" -- a condition that would require delicate and risky open-heart surgery, something that for Emily just was not an option in Ecuador. Emily's young parents, devastated, without resources and powerless to seek specialized medical treatment, found themselves in the same agonizing and desperate situation that thousands of other parents -- perhaps millions -- in so many other developing countries all too often find themselves in. But here is where HeartGift stepped in and brought 16-month-old Emily with her young mother to Austin, Texas, in March of 2013. A week later, Austin pediatric cardiothoracic surgeon Dr. Kenneth Fox and his world-class surgical team at Dell Children's Medical Center in Austin performed life saving open-heart surgery on Emily, successfully repairing her VSD and giving Emily literally a new lease on life. 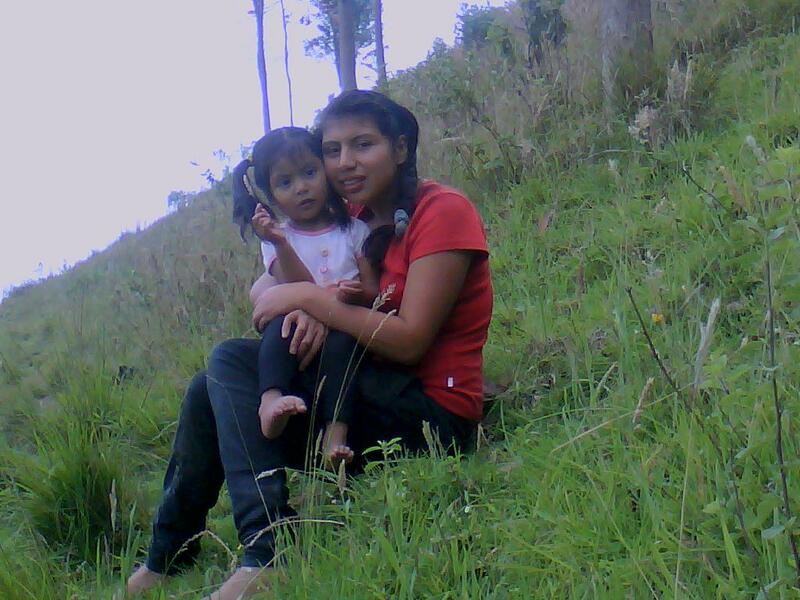 Today, Emily -- almost three years old -- is back in her idyllic home in the mountains of Ecuador leading a happy, normal life thanks to HeartGift. Almost exactly one year later, on March 16, 2014, adorable, one-year-old Saranzaya, also with a "hole in her heart," arrived in Austin after a long 10,000-mile, 3-day journey from a small village in the remote mountainous Arkhangai province in Mongolia and immediately stole everyone's heart. Her heart was healed one week later. Watch her wonderful story below. Emily, Saranzaya and the other HeartGift children are the fortunate ones. But each year, more than 1 million babies are born with a congenital heart defect in the world -- making this the leading cause of death from birth defects. In developing countries, many of these children are never diagnosed and oftentimes, even after such diagnoses, those with the condition cannot undergo life-saving surgery. You can help make the journey to life-saving heart surgery for some of these children possible and a little less torturous by pledging what you can to the HeartGift Baja Bug for every mile the HeartThrobs team completes in November in Baja California. Please watch the delightful video below, where the Crouches promise to go back to Baja in November, "racing for the hearts of children worldwide." "We have the car, the experience, the desire and the mission," they say. All they need is your support. William Van Pelt, CEO of the HeartGift Foundation, sums it all up nicely, "It really takes a community to save each and every child's life; a community of doctors and medical staff, as well as host families and supporters like the Crouches and so many others who are giving their time and efforts to support HeartGift's mission." Won't you join this noble cause with a pledge? Please click here to pledge. Lead photo: Greg and Kay Crouch at the 2013 Baja 1000 race. Kay Crouch is a board member for HeartGift and is also president of Crouch Environmental Services, Inc., a Houston company she co-founded with her husband Greg 20 years ago. To learn more about this company, please click here.